I was a crew chief in the Flight and Operations section of the 22nd Air Depot Group, 97th Repair Squadron. My first and last cruise on a Luxury Ship, The Empress of Scotland, to the mystic land of misery, INDIA. I shared an open state room with a hundred or more other lucky "GIs." We all wore our tux's, day and night. The beds were a little hard, a "GI" blanket on a deck made of hard wood and the pillows were some cork in a life preserver. We landed in exotic Bombay. I've thought a lot of times of a German torpedo and there would have been a lot of shark bait floating in the water. Oh, sure, we saw the ladies in the cages, too! It was here in Bombay, our brave engineering officer freaked out. He had told some of us that we would be working on the airplanes and the enemy would fly over strafing us, and we would be jumping in the slit trenches and firing our rifles at the enemy planes. He had also removed some of his "GI" mechanics from a promotion list just prior to leaving our training .station in Tinker Field, Oklahoma City. He may have had some second thoughts about that too. They probably sent him back to the States and maybe gave him a medal. We never had an engineering officer from that time on. GUYS FROM the 97th Repair Sqdn. out on thejlight line. Photo by Harry Curtis. We were then ushered to a luxury toy train for a speedy sightseeing, entertainment and gourmet dining train ride across this mystic land of misery. In a super cooled, air-conditioned railroad car. Our car contained about ten GIs, there were no windows, just open holes and the famous toilet hole. Oh, yes, a can of Spam one day and a can of corn beef the next. Day and night this speeding train was rushing us to our destination of Khargapur, a thriving metropolis of a rail station and some road side shops on a dusty street. I lost track of how many days it took us to make this one-day trip, but it was many! We were driven a few miles out in the back country and there was this landing strip being built one rock at a time with lots of Indian men doing the "Indian Squat" chiseling rocks to fit and mixing concrete in a pan and pouring it around the rock. Indian women were carrying sand in baskets on their heads from a nearby river. That all changed in a hurry. The Army moved in with trucks and mixers, worked day and night and we had an airfield, runway, parking strips and taxi strips almost in the blink of an eye. Some old rusty metal buildings captured from the Japs, provided the work space for the 22nd Air Depot mechanics. Soon B-29s, flying in from the States, were landing. All this was in a time span of three months. First mission, June the fifth, 1944. We set up our Flight and Operations section in one of these buildings. We had three pilots, a Lt. Lawlen, a Lt. Sellburn and Lt. Wither (not their real names). We acquired a C-64 and a C-61 light planes, a C-46, and a C-47. A gas truck and a cleat track for moving airplanes. These planes were mostly junk no one else wanted. We had a good radio man (Daily was his name) who built us a set, so we could listen to the "BBC" and Tokyo Rose, who kept us informed to the war's progress. And oh, remember the prickly heat rash?? Our pilots soon decided we needed a plane to carry dignitaries so the hunt was on. 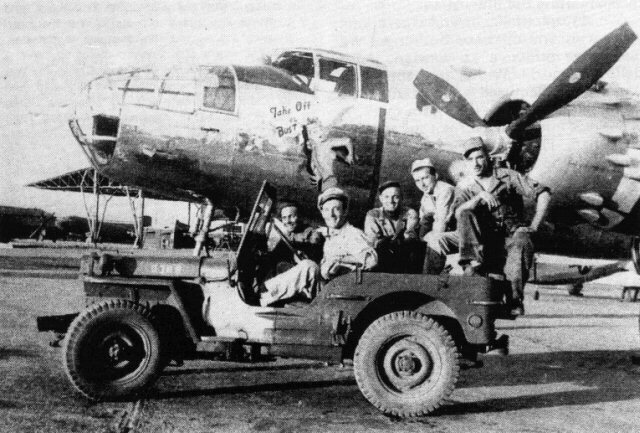 A stop in Barrackpore, near Calcutta, a B-25 was found that had overshot the short runway. Not too badly damaged, it needed a nose, props and a nose gear repair, a few other incidentals. We towed it to a parking space and started looking for a nose. We found one in Agra. With the two, we made one good one! Seven of us spent two months working on this plane. Food was good, I thought, until I read "the meat inspectors" story in the (Ex-CBI Roundup) did he say ugh!! worms?? Reminds me of the eggs and chips we ate in the Indian canteen just off our base. The eggs were about the size of silver dollars with a small yoke, and so tough you had to cut them with a knife. I think they were vulture eggs! I never saw any chickens around there. The plus side of this assignment was Barrackpore was close to Calcutta and Firpo's. When they were unloading cargo in the bay from freighters onto Indian barges, they would overload these barges. Some had tipped over and spilled the cargo. They had retrieved a lot of bottles of beer from the bay. The bad news, was the salt water had rusted the caps and some bottles had taken on salt water. But, the price was right! I think it was five cents a bottle. If it had taken on salt water one mouthful and you knew it. I have thought a lot about what was in that water other than salt! It was the cesspool for Calcutta and the remains of the dead bodies from the burning ghats. We finished repairing this B-25 and were ready to fly it to our base. Our pilot, Lt. Sellburn, would be there the next morning and we would be on our way. The next morning we went out to strip where it was parked and someone had taken the automatic pilot control box out of the dash during the night. We went to the British and asked them if they could help us acquire a control box. Well, they were highly insulted that we would even ask! So, we looked around the field and there was a British plane (American made), a twin-engine Beach, anyway it didn't look like it had been flown in a week or so, and it had the control box we needed So, in the bright sun. two of us put some wrenches in our pocket and had another GI drive us over to this plane and drop us off. He was to pick us up when we signaled him. We had just started to pull this unit out and the hydraulic oil was running down the center of the plane. A British GI, on a tug from the British side, started toward the plane. We laid down figuring they had seen us get in the plane. A couple of things went through our minds like, how we would explain that we were just borrowing this small control unit? Well, anyway, there was a barrel sitting beside the plane and the GI on the tug picked up the barrel and left. We quickly finished removing the unit. "We were going to do a little laundry that evening anyway." We signaled our man and we installed the unit in our B-25. We all climbed in, taxied to the end of the runway. This is our test flight, right down to a short air strip where this plane's last flight was a crash landing. We sat there for a few minutes while Lt. Sellburn checked each engine. The other end of this strip is the Hooghly River. Lt. Sellburn pushed the throttles forward. There was a few moments of anxiety as we raced down the runway. None of us knew if Lt. Sellburn had ever flown a B-25. Had we missed some critical thing? That, soon changed as we lifted off. Lady Luck was with us and we got the hell out of there! Our good friend, Lt. Sellburn, was several years older than we were. He was probably 27 or 28 years old. Most of us mechanics were around 21 years old. Lt. Sellburn claimed his teeth hurt if he flew high, so we did most of our flying at low levels, a few hundred feet above the trees. The view was much better at this height anyway. It's interesting, no one ever asked any pilot if he was checked out on any of these planes. If he was a pilot that was good enough. We had some minor mishaps but no serious injuries or fatalities so we must have been lucky. And, as I look back, no pilot ever questioned our ability or knowledge of these aircraft that we were maintaining. We were just a bunch of cocky kids with a lot of guts and the pilots were just as cocky as we were and had a lot of faith! We were all making history but no one I knew at that time ever gave any thought about history, it was get it over so we could go home. Here is a picture of this gem we named it, "Take Off or Bust." We had an artist who painted a beautiful lady removing her "bra." There was as beautiful a breast as you will ever see, painted on any airplane. Lots of photos were taken of this beauty. B-25 WE SALVAGED from the Hooghly River. Photo by Harry Curtis. We removed everything that we could, to reduce weight, and polished the outer skin of the forward fuselage. What a jewel it was! I have often wondered what happened to our baby. ~ I had the good fortune of flying with several of the B-29 pilots who came to our office and flew some of our planes. Saw a lot of India and Ceylon. I signed up for the famous 45-day recuperation furlough. Within a week I was back in Long Beach, California, to be with my sweet young wife. I had married just four months before shipping out to India. She was my high school sweetheart. A short time later, the war was over and I was quickly discharged, and to be a civilian again. Almost three years in the service, half of that time in India. My wife and I celebrated our 56th anniversary this year! What a lucky break! We had a President who could make a decision to drop the atomic bomb on Japan, without the help of a commission study. I thank old Harry Truman for having the strength and guts to drop it, and never say he was sorry for doing it. I never have heard the Japanese say they were sorry for what they did at Pearl Harbor! I was lucky to not catch malaria, dysentery, or any of the other exotic things they had to offer in this mystic, miserable land called India.